Question after question, request after request for The Spinrite Factory Outlet Tent Sale to happen all over North America… so the question is why Listowel Ontario? Unlike many stores that claim to be a Factory Outlet Store when merely it’s just a liquidation centre or clearance type of store, Spinrite Factory Outlet is truly a factory outlet. Spinrite Yarns are the makers of Bernat, Phentex, Caron, Sugar Lily’n Cream, and Patons Yarns. Can you guess what their home town location is? It’s Listowel Ontario. It’s a rural country community located in South Western Ontario Canada. In fact, it’s merely 35 minutes from my home here in Walkerton? The factory is a stone throw away from the store. It’s directly behind the store. The warehousing is a few blocks away from this store. The prices are phenomenal because the factory is so close. Once any product requires transportation to move it, the costs start to climb. Like the fashion industry that updates itself each year, yarn goes through the same process of clearing stock to make room for new products. The Spinrite Factory Outlet Store is the place for unbelievable savings. Many times, the yarn may not even be last year’s styles, they might just have too much and are clearing it out. That’s when yarnaholics like me get the jitters of excitement going on. You should also note that I am a guest of The Spinrite Factory Outlet Store, I am not involved in anything pertaining to decisions, locations and pricing. The store has an annual August Tent Sale that has become so well known for savings, thousands of people show up to take advantage of the warehouse clearing the stock out. There’s a reason why you see people stuffing their cars, vans and trucks… the prices are that phenomenal. While at the sale this week, Ian – our Intern, found a man singing the blues about losing his wife at the Spinrite Factory Outlet Store. It was really cute! This entry was posted in Advice & Tips, Crafting Shows and tagged August Tent Sale, It Listowel Ontario, Listowel, Ontario, Paton's Yarns, Sales, South Western Ontario Canada, Spinrite Factory Outlet, Sugar Lily, Yarn. Bookmark the permalink. 21 Responses to Why Listowel Ontario for the Huge Annual Tent Sale? Is there factory outlet open for regular business? Also, I plan on attending next August (is this the only time of year they have it) It’s a 9 hour drive from Wisconsin..but it will be worth it. 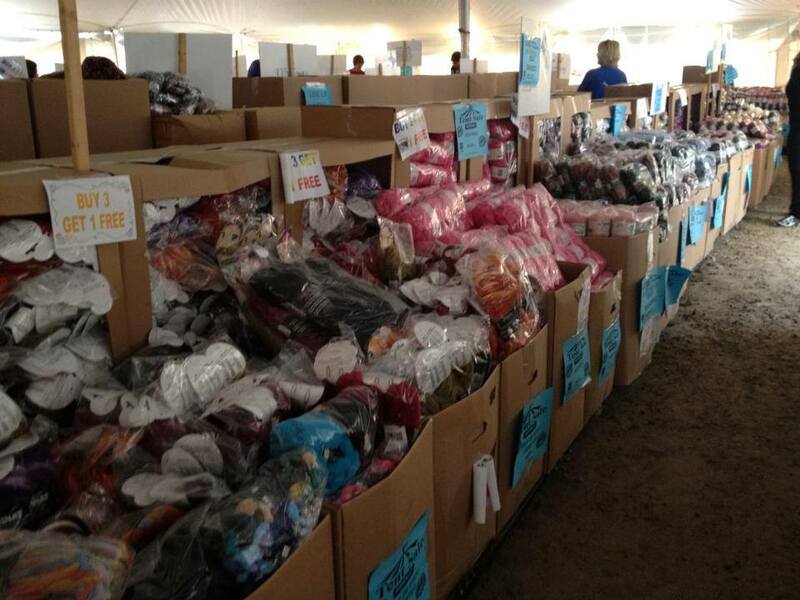 The Spinrite tent sale is not to be missed – people filling their vehicles with enormous bags of brand new yarn at amazing prices – I’ve gone to this sale for years. I used to live in Kitchener-Waterloo (25 minute drive to Listowel). I now live in Paris, Ontario, home of the Mary Maxim store, and their annual tent sale is the last 2 weeks of August. I guess I’ll just have to go to that as well! The cost of flying and getting my passport would eat any savings. I’d have to buy a lot of yarn to recoup… hmmmmm. And then think of the cost of shipping it back — either with you on the plane and paying for an extra large suitcase or sending it by mail. I live about an hour from Listowel and shop there often it is exactly as mikey described it. While it is unfortunate that everyone can’t attend the sale it is wonderful that Spinrite has stayed in a small town like Listowel as there is very little else in manufacturing or factory work left in southwestern Ontario. I am very happy to support them for that reason we really need the jobs here. I am sure every area has some local specialty item that others wish were available I would love fresh ocean fish, but not likely here inland. Would love to attend a sale like this, but too far for this Missouri gal. Happy for those that are able to enjoy and load up on such great bargains. It is crocheter’s dream or knitter’s to go shopping like that for yarn. I told my mom about it and we are budgeting so that we can plan to go hopefully next year. Thank you for this article. I love a good sale, but I just don’t have the room to store any more yarn. And it’s completely opposite to my yarn shopping regimen – I come across a pattern I’d like to make, then I buy the yarn for it. I commend your restraint. Actually I tend to do that also for my personal projects, except that people have been giving me their leftover yarn of late because they know that I will use it for my charity projects. Thus I still have a stash anyway. Maybe this is the best of both worlds. I will love to go to that sale cuz I live yarn. I would love to be able to take advantage of sales like this; but unfortunately we not only don’t have any yarn factories here, but also we don’t have any yarn stores(except one very expensive specialty store)! And that’s in a major city with a million people in the metropolitan area! If it were only possible to go to Listowel, but like you said, the transportation costs destroy the worth of that! I’m lucky I’m close enough (roughly 3 hrs) to make the drive. I just need to get my passport so I can get there next year to attend. Going to drag my husband so I can get even more and not pay duty tax!! LOL I love those yarns! I find it difficult to find the yarns here in my area. I’m looking forward to next spring and summer!! Factory Outlet sales in Canada are different than in the U.S.. The only GOOD factory outlet sales are like the ones talked about in the article above – directly at the factory itself! I live in Niagara Falls, Ontario. I would have LOVED to get to Listowel for the tent sale, but just a bit too far for me to drive on my own. Maybe next year I’ll find someone to go with me. 🙂 It looks like an awesome sale!!! oh – and good article!! Well said! Pam, I went on Monday. I replied to your request through Spinrite for a ride and sent you a private message to see if you wanted to join me. I will be going again next sale in May. Maybe we can meet for that one!! Oh Karolin I would love to join you as well. I am from Port Colborne and I so wanted go!